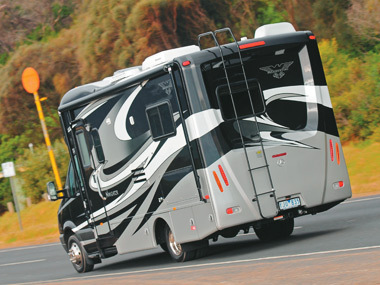 AS I WALKED into the Presidential showroom in Moorabbin, just outside of Melbourne, I was surprised to find not a line of motorhomes, but a staggering range of imported luxury vehicles. Ferraris, Porsches, stretched Hummers, you name it. It turns out Presidential is a major player in the luxury and limousine rental market, importing from the US. In fact, Navigators are partly built in the States before hitting Australian roads. "Work quality in the US is very high," director Paul Caminiti said. "It's an aggressive market and manufacturers who don't put out good product don't survive." Presidential sends its right-hand-drive chassis to Elkhart, Indiana, where more than 80 per cent of US RVs are manufactured. They are then built and brought back to Australia, where plumbing, appliances and electrical work is completed, complying with local laws. 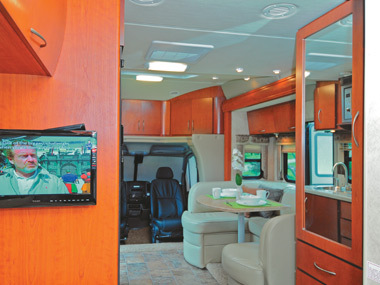 The Navigator 24SAU is based on a Mercedes Benz Sprinter, and while it's true many motorhomes are built on the same foundation, the reasoning for that is sound: they make a terrific base vehicle, with a powerful engine and rock-solid chassis. The Navigator's Benz Sprinter 519 chassis was specifically selected by Presidential for its relatively lighter weight. "The Benz chassis helps us keep the weight at 4490kg, which means people can drive it with a normal car licence," Paul said. "People in the grey nomad market don't necessarily want to get a new licence, so the lighter weight means a wider range of customers." As we drove, the first thing I noticed was the Navigator's power when pulling away. I was expecting more of a lumbering giant, but the Navigator's Mercedes 3L turbodiesel V6 packs more than enough grunt to make you forget you're sitting in what is essentially a house on wheels. The other factor that struck me was the comfort inside the cab. There was loads of head and leg room, and the interior was extremely well-finished and comfortable. One reason for the extra space was no console between the seats, which is something of a double-edged sword: it means more room, but less storage and nowhere for drink/phone holders, etc. Either way, it worked well in this case and I would imagine that if you were driving for hours at a time, it would be a welcome change from the cramped feeling you often get at the end of long day's touring. The cab also included large, clear dials, a reversing camera (handy for these larger units) and swivel seats. The Navigator is a very attention-grabbing unit. 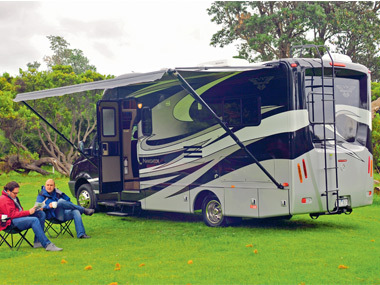 The single-piece fibreglass (front and back) body is covered with a striking black and grey automotive paint job, which elicited several double takes from fellow RVers. A walk around the outside reveals a remarkable amount of storage, with swinging doors seemingly covering every inch of the base. The nearside is home to a generous boot, a huge space for the (optional) rear slide-out barbecue and a dedicated bin for gas cylinders. 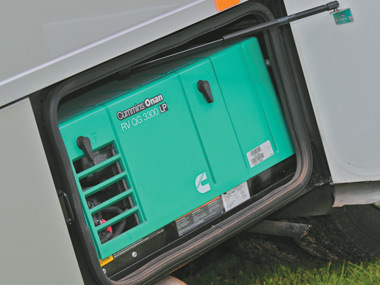 On the offside, there are three more small compartments under the slide-out (one contains the mains power socket and another the slide-out controls), plus a service compartment for fresh water connections, grey water dump and a hot and cold exterior shower. All exterior storage spaces are serviced by sturdy swinging doors, which work on a strut and are designed to not blow closed in a breeze. Also, the swinging doors mean the offside bins can still be accessed when the slide-out is extended - a very handy feature that could easily go unnoticed. The slide-out itself is a fairly large unit, but that extra width is offset when you see what it provides inside. 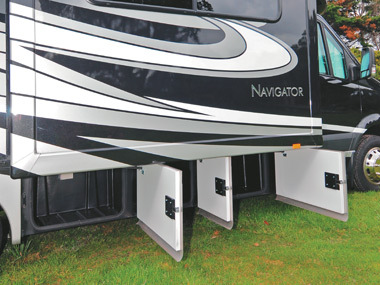 The slide-out also has its own in-built awning, which helps stop debris getting caught in the sliding mechanism. Around the other side, there is plenty of scope for exterior living under the enormous Dometic awning (manual as standard, automatic as an option), with the aforementioned slide-out barbecue and good exterior lighting. All windows are glass rather than perspex and the top of the motorhome is a crown roof, which Paul said is designed with caps over the walls to prevent weather from seeping in, and also means it can be walked on. 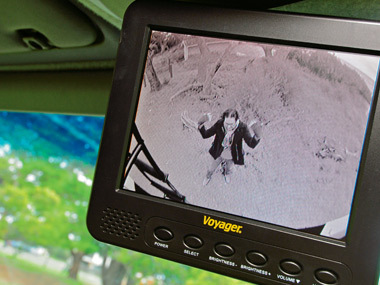 A 2.5t Hayman Reese towbar is fitted as standard, as is an infrared reversing camera with a rear microphone, so directions don't have to be yelled from the front. A classy automatic power step greets you as you open the door and get ready to enter. Once inside, the nearside kitchen is on the right and large club dinette opposite, with rear bedroom and offside corner ensuite. The kitchen is not especially large, featuring a cooktop and stainless steel sink. Bench space is somewhat limited, and while there are covers for the cooktop and the sink, the latter does not sit flush when in place and would likely become an annoyance. The cooktop is only a two-burner, but the microwave is actually an oven/grill combo, so all cooking needs should be met. There is also a very generous 185L three-way fridge and stainless steel rangehood. Storage is serviceable, with a few cupboards above the fridge and bench, as well as drawers and cupboards below. The kitchen is also home to the power centre: 12V, 240V and inverter. Sitting in the large slide-out, the U-shaped club lounge dinette is a highlight. I am usually partial to a cafe-style dinette (which is actually standard in the Navigator), but this particular club setup went a long way to changing my mind. The leather upholstery, comfortable cushions and windows all-round make the lounge an excellent place to have your dinner and watch the front wall-mounted flatscreen TV. While the relatively small dinette table is still best suited to a couple, that couple will sit in plenty of comfort - one can even put his or her feet up. And as an added bonus, the table can be collapsed down to create an oversized sleeping space if the kids come along. On the negative side, there is limited storage space, with only a few overhead lockers and none of the usual under-seat space. Speaking of space, the rear bedroom was a problem for me. While purportedly a double bed, the mattress is tucked right into the nearside corner. And "tucked" is the right word: each side of the mattress is flush up against a wall, with only a single corner free for longer legs. While some people may like that feeling of cosiness, taller people like me (6ft 1in) would have some trouble comfortably fitting into the space, especially if they have to sleep on the inside. The tight space also means no shelves or space to put books, glasses, etc., but there are three large overhead lockers for storage. On the plus side, the wall at the end of the bed (between the mattress and the fridge) is home to a smaller wall-mounted TV, which means travelling couples can maintain their separate viewing habits if they choose. Next to the bedroom, the ensuite features a swivel cassette toilet, separate shower cubicle and a vanity. The door to the shower is of particular interest because it is a corner-sliding number with a very secure catch. 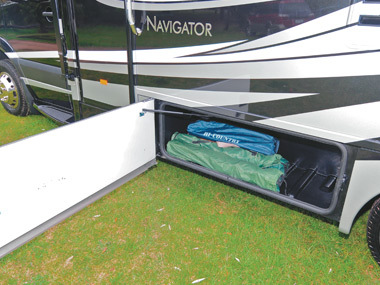 I mention this because it is a space saver and the catch is reassuring in that you don't have to worry about a door coming open when travelling. The cubicle itself has three handy moulded shelves and a flexible-hose shower. There is good lighting over the large vanity mirror and hatches for the toilet and shower. 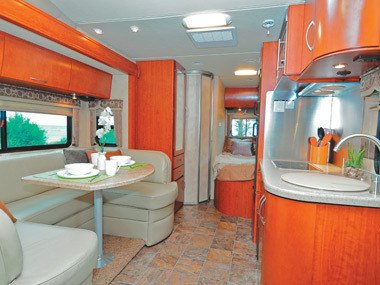 Motorhomes have always fascinated me. I like the idea of travelling in your accommodation, as well as the appeal of the often larger space. And with the exception of the tight bedroom, the Navigator did not let me down. I found it a comfortable and appealing unit, which was easy to handle on the road and had a surprising amount of power, all on a tried and tested Mercedes Benz Sprinter base. I was also very taken with the Navigator's aesthetics. If cruising in something other than the stock standard is important to you, Presidential is a company you should look at - its grey unit is also an eye-catcher. 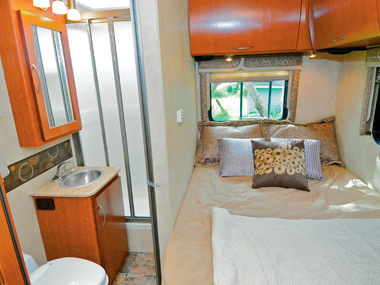 The Navigator is a luxurious and comfortable rig well suited to a motorhoming couple who like to travel in style. 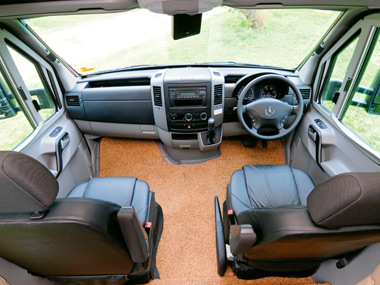 And if they feel at home sleeping in very 'cosy' spaces, then the Navigator is definitely for them. 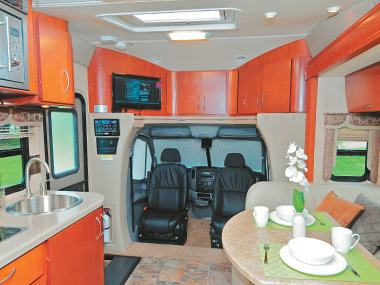 Source: Caravan World Nov 2011.